A vast variety of landscapes can be found all around the United States of America. As one travels across the huge nation, there's simply so much to see, from awe-inspiring mountainous regions and alpine lakes to forests, canyons, sprawling cities, and so much more. The nation is blessed with so many sites of supreme natural and man-made beauty, including some of the prettiest beaches anywhere in the world. All along the Pacific Coast, Atlantic Coast, and the Gulf of Mexico coast to the south, American beaches offer safe havens for people to gather with friends, family, and other loved ones, forgetting about their lives and simply relaxing in a picturesque place. If you're planning a beach vacation in the United States, California has to be one of the top spots for you to consider. Offering some of the best coastal cities, warmest weather, sunniest skies, and most gorgeous beaches, California is the perfect place to spend the spring or summer. Many tourists in the area are drawn to iconic locations like Malibu or Venice Beach, but if you're looking for something different in California, why not consider a trip to Bodega Bay? Just 40 miles north of San Francisco, this bay is a highly popular recreation and fishing location, home to a lot of marine wildlife and some superb beaches for exploration, sunbathing, and strolls. The Bodega Bay area is a very unique spot on the Pacific Coast. An area of land called Bodega Head juts out into the Pacific Ocean, protecting the nearby Bodega Harbor and much of Bodega Bay and ensuring that the waters in this area are very calm and peaceful, making Bodega Bay beaches perfect for people in need of a quiet place to relax and reflect. 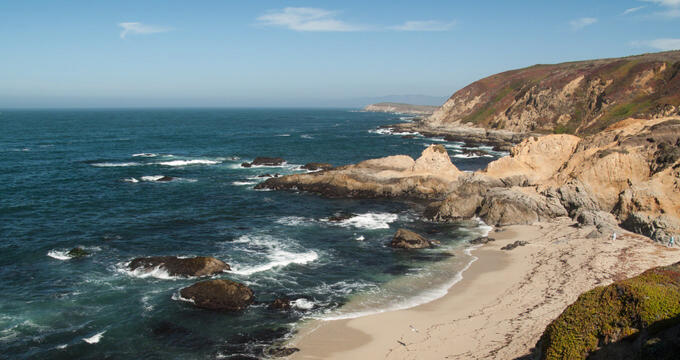 If you’re planning a Bodega Bay trip, read on to learn all about the best beaches in this area. One of the most northerly beaches at Bodega Bay, this beach is found right by Bodega Head, the large rocky formation that protects most of the bay. The waters here tend to be a little choppier than they are down in the bay, but it's still a great area to visit, offering some rugged coastline walks and a cozy little picnic area. The winds can get quite high around Bodega Head Beach, so guests will need to be prepared for that, but it's a nice spot to do some hiking and take some photos, with lots of high points offering beautiful views of Bodega Harbor and the rest of the bay. This is also one of the best Bodega Bay whale-watching beaches. The Bodega Dunes State Park is named for the large sand dunes found around the area. This is one of the biggest Bodega Bay beaches and includes a lot of amenities including camping facilities, picnic tables, BBQ grills, and public restrooms. Bodega Dunes is a nice beach to simply stroll along, picking up pieces of driftwood and exploring the dunes themselves, with many tourists choosing to set up camp in the area and stay the night. The Bodega Bay area is well-known for its pretty cliffs and special rock formations, and Gleason Beach is one of the best places to visit if you're interested in the fascinating local geology of this part of the Pacific Coast. It's a rocky beach, so not particularly suitable for sunbathing or beach games, but wonderful for those with an adventurous spirit. Gleason Beach visitors will have a lot of fun exploring the various rocks and admiring the sea stacks, but beware that there are no amenities at this beach and swimming is strongly discouraged. This beach was named after a unique rock formation that has created a little archway. It's a very pretty sight and a popular spot for tourists to take some photos, with lots of other rocks and boulders dotted around the surrounding landscape. Waves all around Bodega Bay tend to be calm, but they're especially small and soft here. Fishing is popular at this beach, which doesn't allow dogs and has no notable amenities to speak of apart from free parking. This is one of the biggest and widest of the Bodega Bay Beaches, so even on the busiest of days, it never gets too crowded. Visitors to this beach will be rewarded with some truly breathtaking views out to the horizon, and there are some interesting rock formations to be discovered on Wrights Beach too. A local campground offers easy access to the beach and has more than two dozen camping spots offering ocean views, so Wrights Beach is a good place to base yourself if you want to spend a weekend or longer at Bodega Bay. Fishing and hiking are popular her too and there are restrooms and picnic tables by the beach. Pinnacle Gulch Beach is one of Bodega Bay's best-kept secrets. Few tourists even know this beach exists, but it's actually quite close to Bodega Harbor and is a big hit with the locals. This is one of the best places in Bodega Bay to come and watch the sunset as the sky starts lighting up with pretty shades of pink and red. As with other Bodega Bay beaches, lots of large rocks can be found here and there's a good chance of spotting some wildlife too.